(Nanowerk News) Technological limitations have made studying friction on the atomic scale difficult, but researchers at the University of Pennsylvania and the University of California, Merced, have now made advances in that quest on two fronts. By speeding up a real atomic force microscope and slowing down a simulation of one, the team has conducted the first atomic-scale experiments on friction at overlapping speeds. The study was led by graduate student Xin-Zhou Liu and professor and department chair Robert Carpick, both of the Department of Mechanical Engineering and Applied Mechanics in Penn's School of Engineering and Applied Science, and Ashlie Martini, associate professor in UC Merced's School of Engineering, with Zhijiang Ye, a graduate student at UC Merced. Yalin Dong, a former member of Martini's research group, and Philip Egberts, then a member of Carpick's research group, also contributed to the research. Their study was published in Physical Review Letters ("Dynamics of Atomic Stick-Slip Friction Examined with Atomic Force Microscopy and Atomistic Simulations at Overlapping Speeds"). 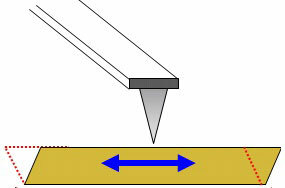 A phenomenon known as "stick-slip friction" is very often involved in sliding at both the macro and the atomic scales. The resistance associated with friction is the product of atomic points of contact between two objects being temporarily stuck together, where they remain until the applied force provides enough elastic energy for those points to break apart. These points then slip and slide until they get stuck again. At the atomic scale, sticking points occur for every repeating set of atoms along the sliding direction. Studying the atomic interactions that underlie stick-slip friction is inherently difficult as the points of contact are obscured by being flush against one another. To get around this problem, friction researchers often use the tip of an atomic force microscope, or AFM, an ultra-sensitive instrument capable of measuring nanonewton forces, as one of the points of contact. Since an AFM tip works much like a record needle, researchers can measure the friction the tip experiences while it is dragged over surface. Friction researchers also use simulations, which can model the dynamics of all of the individual atoms. Instead of moving the AFM tip, Penn researchers moved the sample being scanned, maintaining high resolution at faster speeds. "A powerful approach is to combine experiment with simulations," Liu said, "But the major problem doing this in the past has been that the sliding speeds at which the experiments and the simulations are performed don't match up." The quality of the measurements in an AFM experiment depends on isolating the tip from any stray vibrations, so traditionally researchers drag the tip very slowly, moving about one micrometer in a second at the fastest. To match this experiment in a simulation, the individual atoms of the tip and the surface are modeled on a computer, and the virtual tip is dragged the same distance as the real AFM tip. This presents a problem, however, because, to capture the impact individual atoms have, each frame in the simulations must be calculated in femtosecond steps. A computer processing a million steps a second would need about 30 years to simulate the real AFM experiment's micrometer-per-second speed. "That means to get the same distance in a shorter period of time, we need to move the model tip much, much faster," said Martini. With the sliding speed of the virtual tips starting a million times faster than the physical ones, the researchers resolved to meet in the middle. The UC Merced contingent worked on slowing the tip in their simulations, while their counterparts at Penn developed ways to speed up their physical experiments. As traditional motors can't move AFM tips with the nanoscopic precision necessary for their experiments, the tip and the cantilever it is mounted on is driven by a piezoelectric plate. The top layer of this type of the plate shifts laterally away from the bottom layer when a certain voltage is applied, pushing the cantilever and tip across a sample surface. "For the resolution required for our atomic friction study, the scanner inside a commercial AFM can only reach a few hundred nanometers per second," Carpick said. "That's an intrinsic limitation of the instrument; if you go over that top speed, you get large oscillations in your signal. Our solution was to make a very compact shear piezo plate and use it to move the sample instead of the tip." By moving the sample, a thin film of gold coated on a silicon die, instead of the tip that is driven by a much heavier scanner, the Penn team was able radically increase the experiment's overall speed. With lower mass, the smaller plate can move faster without causing noisy oscillations. "The relative motion is the same," Liu said, "but this means we can go a thousand times faster than before while maintaining the resolution we need. We had to add entirely new electronics for capturing the data as well since no one has had to record it so fast before." While the Penn team was speeding up their systems, the UC Merced team was slowing them down. The researchers there took advantage of the relatively long periods of inactivity where the tip was stuck, waiting for enough energy to slip forward. Some of this energy is provided by the relative motion of the sample against the tip, but the random vibrations of the atoms involved, resulting from thermal energy, can make the slipping transition occur faster or slower. "Recognizing that," Martini said, "gives us the ability to use a suite of simulation tools for what are called 'infrequent event systems.' These are tools for making these infrequent events happen more quickly while still preserving the underlying physics." Using a technique known as "parallel replica dynamics," Martini's group used the fact that the probability of one of these infrequent events occurring is the same whether one simulation was run for a thousand femtoseconds or a thousand simulations were run for one femtosecond each. Running identical simulations on as many processors as possible, the researchers would stop them all as soon as one virtual tip slipped, then synchronize the simulations at that point and start them all again. "This allows us to effectively increase the duration of the simulation by parallelizing it in time," said Martini. "You're increasing the simulation time and therefore decreasing the model tip speed by a factor of how many processors you have." By matching the tip speeds in the physical and virtual experiments, the researchers were able to demonstrate a heretofore-theoretical difference between macroscale and atomic slip-stick friction. Velocity typically doesn't factor into the amount of friction macroscale objects encounter, but on the atomic scale the vibration of individual atoms due to thermal energy could play a role. The researchers showed that these vibrations do counteract friction by helping the tip slip forward but only to a point. At fast enough speeds, the tip is not stuck long enough to receive a "boost" from thermal energy. "Investigating and understanding the effect of friction at the speeds in our experiment are important," Liu said," as they're much closer to what our current and future engineering applications, such as micro- and nanomechanical devices, will experience than what we can normally do with an atomic force microscope." "This study," Carpick said, "now opens up many possibilities for using the full atomic insights available in atomistic simulations to reliably interpret the results of experimental studies. We're optimistic this will eventually lead to general and practical insights to understand, control and reduce friction and wear."